In March–April 2008, an excavation season was conducted in memory of Prof. Yizhar Hirschfeld in the city center of ancient Tiberias, at the site of Tiberias – Berenice Channel (License No. G-16/2008, map ref. 251370/742520). The excavation, under the auspices of the Hebrew University Institute of Archeology and underwritten by Yad Ha-Nadiv, with the assistance of the Tiberias municipality and the blessing of the Israel Antiquities Authority, was directed by A. de Vincenz (pottery analysis), S. Miller (computerization) and A. Amitai, with the aid of Y. Patrich (scientific guidance), E. Meir and R. Darby (area supervision), M. Osband and S. Freireich (stand-in area supervision), H. Shani (administration), D. Porotsky (surveying and drafting), A. Iamim (surveying and preparation of plans for publication), T. Sagiv (field photography), A. Berman (numismatics), M. Lavi (conservation and treatment of the finds in the laboratory), S. Hadad (glass), A. Lester (metal artifacts) and M. Sadeh (archaeozoology). Laborers from the Sawaʽad tribe of Sakhnin and Wadi Salameh, as well as volunteers from Israel and abroad participated in the excavation. Much assistance was rendered by E. Hirschfeld, D. Avshalom-Gorni and D. Barshad (IAA), Z. Ovad (mayor of Tiberias) and O. Ovad (Tiberias city council member). The excavation was conducted at the site excavated by Y. Hirschfeld during the 1993 and 2004–2006 seasons. The excavation focused on three areas that yielded architecture and finds that date from the beginning of settlement in Tiberias, in the first century CE, until the urban center was abandoned at the end of the eleventh century CE (A, F, H; Fig. 1: the 2008 excavation areas are marked in red; Hirschfeld and Meir 2006). The excavation was intended to clarify stratigraphic issues that remained unresolved at the time of Hirschfeld’s death, so as to facilitate the writing of the final report of his excavations. 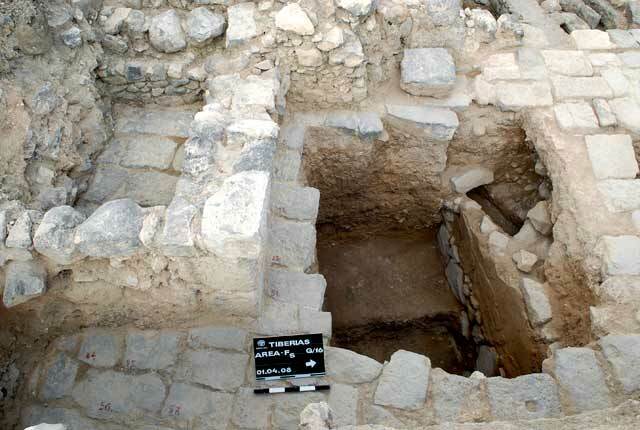 Two probes were opened in the bathhouse in Area A: a probe (A1; 1 × 1 m, enlarged to 1 × 3 m) in the caldarium of the early phase of the bathhouse; and a square (A2; 3 × 6 m) opened south of the street bordering the bathhouse on the south. The excavation in this area sought to understand the plan of the building and determine its date; although most of the structure was exposed by Rabani in the 1950s, he published only preliminary reports (Rabani 1953; 1955; 1956). Probe A1 (Fig. 2) was opened in the cement floor of the caldarium of the early phase of the bathhouse, located in the southwestern part of the building, c. 15 m east of the cardo, in hope of dating the building. The outline of an apse (radius 2.7 m) buried under the caldarium floor could be discerned; it was set between two walls (W146, W147) and opened to the north. The probe, opened to the south of the apse’s wall, yielded pottery sherds dating from the first century BCE to the first century CE, including a fragment of a WTS bowl. These results do not allow a better dating or understanding of the complex, since they do not date the caldarium, but rather the date the apse. In lieu of finds that could have dated the caldarium, its date was determined by its stratigraphic position to be the third–fifth centuries CE (Miller 2016:226). Square A2 (Fig. 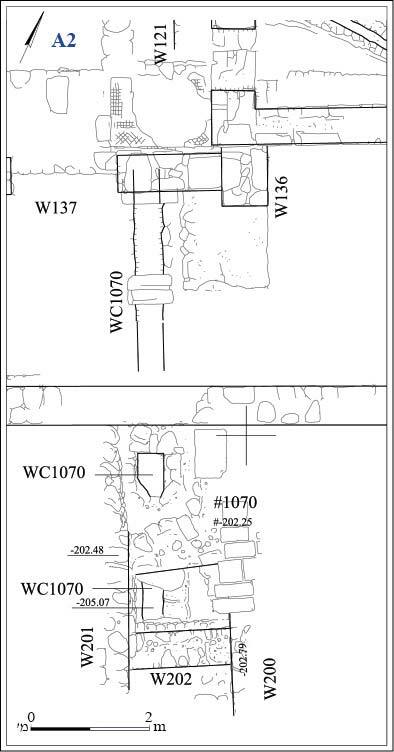 3) was opened to determine whether a water channel (WC1070) identified south of the bathhouse conveyed water to the bathhouse or drained water away from it. Three walls (W200–W202) belonging to an unidentified building from the Early Islamic period were exposed. The walls were constructed above a stone-built shaft connected to the water channel, and near a pavement (#1070), which may have covered the channel. The latest finds uncovered in the shaft and inside the channel are dated to the Late Byzantine or Umayyad period, and represent the final stage of their use. Judging by the gradient of the channel and the absence of plaster on its inner walls, the conduit was evidently used to drain the bathhouse when that facility was enlarged at the end of the fifth or in the early sixth century CE. 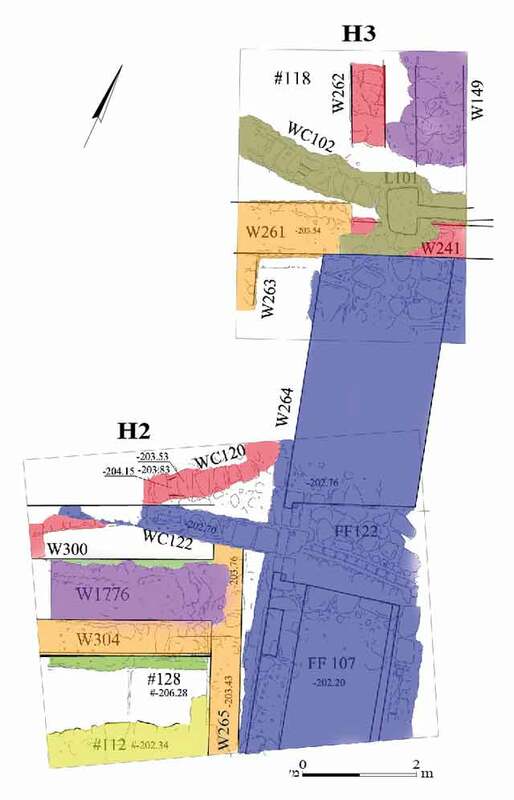 The excavation focused on four locations (F2–F5) in a large building complex, with the aim of addressing several unanswered stratigraphic questions. 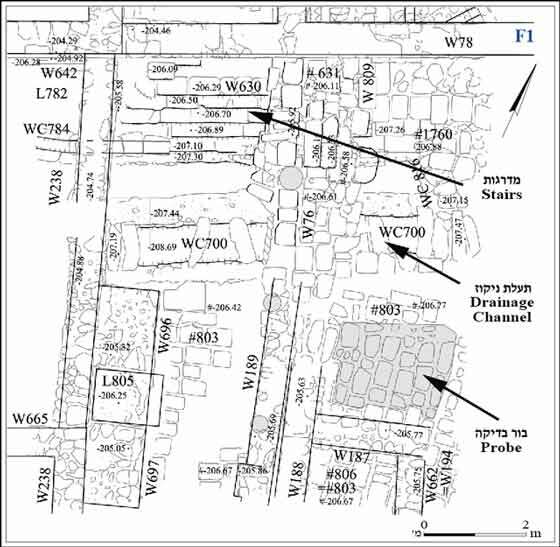 This complex, now identified as an urban mansion (Miller 2015; Weiss 2016), was first excavated by Druks, who believed it was a basilica (Druks 1964a; 1964b), and later by Hirschfeld, who suggested it was the seat of the Sanhedrin of Tiberias (Hirschfeld and Meir 2006; Hirschfeld and Galor 2007:226–229). The excavation also focused on the southeastern part of the area (F1), where steps leading to the mansion, as well as a sewage system and a considerable amount of construction from the Early Islamic period were exposed at the end of the 2006 season. F1. A probe (c. 1.75 × 2.50 m; Figs. 4, 5) was opened beneath a plaza paved with basalt flagstones (#803), south of the hard limestone steps leading to the mansion from the east and south (W630, W809). The ceramic finds from the fills underneath the plaza indicate that it was paved in the Umayyad period. A wall and a plaster floor unearthed in the probe were attributed to the Roman period based on pottery from the first century CE found in the fill beneath the floor. The fill beside the wall and covering the floor contained pottery sherds from the first–fourth centuries CE. Also found in this fill were fragments of plaster, some painted and decorated and others bearing the impression of canes, suggesting that they were part of a roof, possibly in a Roman-period building. This building was evidently dismantled at a later phase, when a drainage channel (WC700; width c. 0.7 m, exposed depth 1.5 m) was constructed. This channel connected to the main drainage channel, which led east to the Sea of ​​Galilee. The channel was constructed of partially hewn basalt blocks and fieldstones and was covered with basalt slabs; several of the slabs were found in situ. No floor was found in the channel; it may never have had a paved floor in the first place. Layers of travertine deposited in the channel point to its prolonged use. The date of its construction could not be determined, but the pottery accumulated within the alluvium layers inside the channel indicates that it was used at least until the Early Islamic period. F2 was opened in the eastern wing of the mansion, yielding two walls (W254=W643; Fig. 6) belonging to the mansion, and hence dated to the early Byzantine period (around the early fifth century CE). Evidence of construction during the late Byzantine period—blocked openings and raised floors—was revealed in this part of the building in the past. This season it became apparent that the wall previously identified as the southern wall of the complex was not the original wall, but rather a later construction that replaced the original wall. This is evidence of changes that were implemented in the southern entrance to the eastern wing of the building. F3, F4. 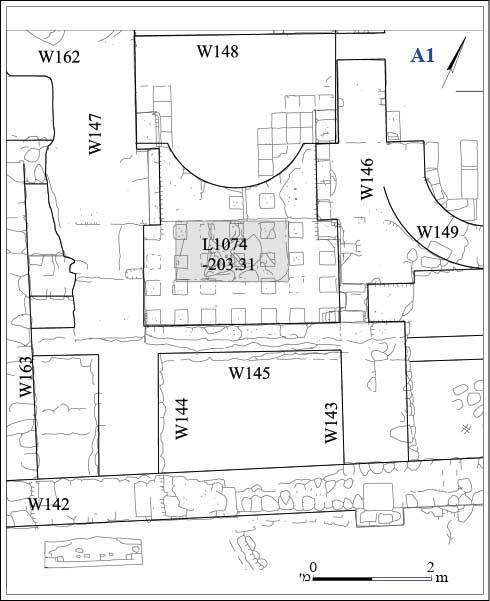 Probes in the northern part of Area F sought to ascertain the date of the mosaic floors identified as part of the mansion. Pottery dating from the Roman and early Byzantine periods was found in the fill beneath the foundation of the northern floor (F3), and pottery and coins from the Roman period were found in the fill beneath the western floor (F4). These finds, dating to no later than the fourth century CE, are consistent with the date of the first phase of the mansion (the beginning of the fifth century CE). F5. A small excavation was conducted to clarify the date of a channel exposed in previous seasons in the western part of the area. The channel, which conveyed water from an unknown source in the south to below the Abbasid street in the western part of the area, severed the walls of the Byzantine-period mansion. 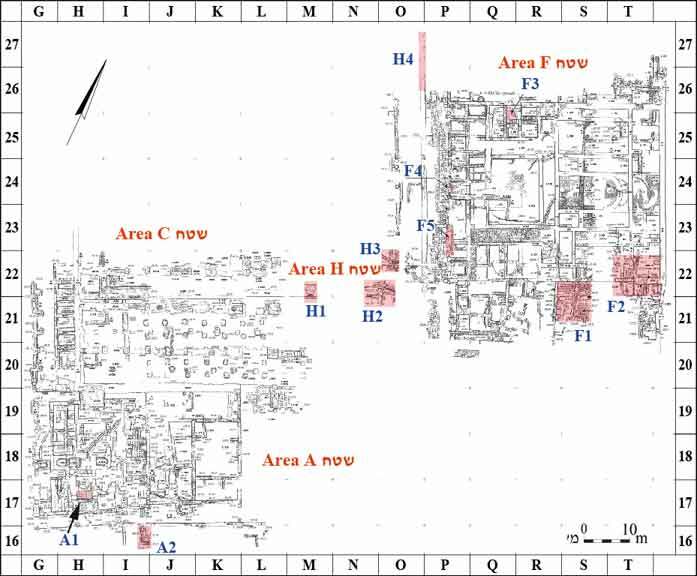 Four excavation squares were opened in Area H (Sqs H1–H4), a hitherto unexcavated area between Areas F and C. Previous excavations in Area C revealed a building identified by Rabani (1953; 1955; 1956) as a market and by Cytryn-Silverman (2009; 2012) as a mosque. These remains will be described chronologically. The Roman Period. 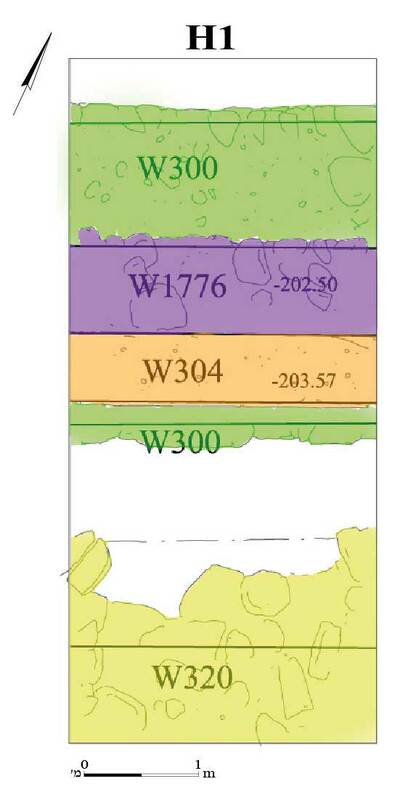 Sq H1 yielded the eastern continuation of a massive, east–west wall (W300; exposed length 3 m, width 2.85 m; Fig. 7: green), which Hirschfeld identified as belonging to the second-century CE Hadrianeum (the Temple of Hadrian; Hirschfeld and Galor 2007:214–215; Miller 2017). The wall was built of two rows of roughly hewn basalt stones and a core of gray cement mixed with fieldstones. The southern face of the wall was built of stones that were hewn more meticulously than those of the northern face; it is therefore assumed that the southern face was the outer face of the wall. A probe opened alongside the southern face of the wall exposed its foundation, which is similarly built of basalt stones and mortar, but without the finely hewn stones that were visible in the superstructure. Although the probe reached a depth of more than 4 m, the base of the foundation was not exposed. The fill alongside the wall contained pottery from the Early Bronze Age and the Early Roman period, corroborating Hirschfeld’s dating for the wall—the second century CE. The continuation of W300 was found further east, in Sq H2 (Fig. 8: green); its eastern end was not unearthed, as it is covered by later walls. A white plaster floor (#128) abutted the wall from the south; the ceramic finds in the fill beneath it date from the Roman period. The Byzantine Period. 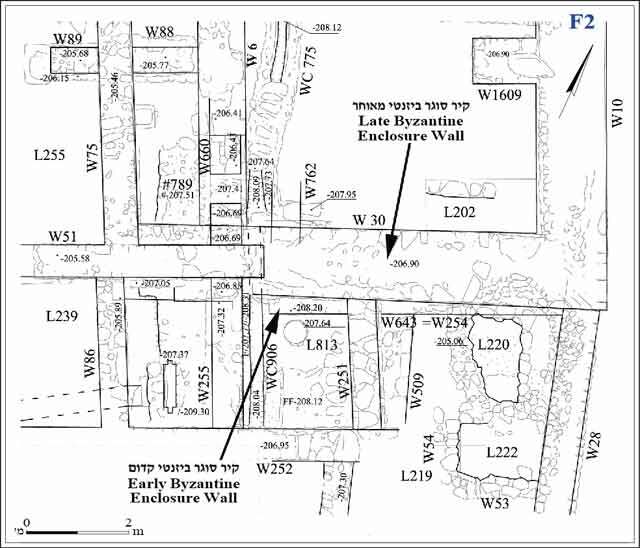 The west part of the early Byzantine-period mansion was revealed in Sqs H2 and H3 (Fig. 8: red). A mosaic floor decorated with a geometric pattern (Fig. 9) can be attributed to that structure as well. The floor was only partly preserved, as it was severed by a later channel. A patch of a wall painting (c. 2.1 × 2.7 m) depicting colored panels and a garland was exposed in situ on the western face of the wall of the mansion in Sq H3. 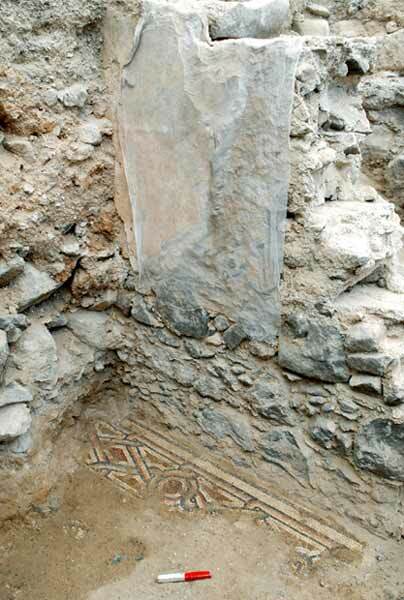 An additional mosaic floor belonging to the mansion was partially uncovered c. 5 m to the east (not on the plan). This floor features a water fowl, probably part of a more extensive composition that adorned the room (Miller 2015:252). A corner formed by two walls (W261, W263) in Sq H3 is attributed to the late Byzantine period (Fig. 8: orange). It is located where a wall, oriented east–west, appears to be a renewal or reinforcement of a wall from the early Byzantine phase (W241). Two other walls found in Sq H2 can be ascribed to this phase. One is an east–west wall (W304) built over the southern part of W300, which served as its foundation; its western continuation was visible elsewhere in the area as a construction on top of W300 (e.g., in Sq H1; Fig. 7: orange). Wall 304 adjoins from the west a wall oriented north–south (W265). This phase could not be dated with certainty; it is ascribed to the late Byzantine period because it differs in nature from the walls of the mansion, while at the same time it is later than W300 from the Roman period and predates the Umayyad period (below). The Umayyad Period (Fig. 8: blue). A wide, north–south wall (preserved length 9.3 m, width 2.5 m) from this period was exposed in Sq H2. Threshold stones set in the western face of the wall indicate the location of a paved opening that led into the building, from west to east. A channel with an incorporated terra-cotta pipe was found within the wall, below the threshold and pavement in the opening. The source of the channel is unknown; it runs alongside the eastern face of the wide wall, leads northward, turns westward into the opening and continues further west, beyond the building. The northern end of the wide wall abutted the walls of the two Byzantine-period phases. The wall is dated to the Umayyad period based on its stratigraphic context and the late Byzantine-period pottery found beneath the paved opening and in a probe dug into the wall. The wider context of the wall, within the building complex exposed in Area F, remains unclear, mainly due to extensive plundering along the eastern face of the wall during the modern era. The Abbasid Period (Fig. 8: purple). The southern end of the mosque’s eastern stylobate (W149) was exposed in Sq H3. The northern continuation of the eastern wall of the mosque complex (Fig. 1) was unearthed in the northern part of the area (Sq H4). A portico facing west, onto an open courtyard, can be reconstructed between these two walls. The southern wall of the courtyard (W1776) was built over W300, which served as its foundation (Figs. 7, 8: purple). This wall also served as the northern enclosure wall for the roofed part of the mosque. The western continuation of the wall in Sq H1 (Fig. 7: purple) was sealed by the floor of the mosque from the Fatimid period (below). Fills excavated north of the wall contained pottery from the Roman–Abbasid periods, pointing to a date in the eighth–ninth centuries CE for the construction of the wall. No foundation trench was identified for this wall, suggesting that fill was deposited against the wall as it was being built. The Fatimid Period (Figs. 7, 8: yellow). A wall in the southern part of Sq H1 is identified as one of the stylobates of the later mosque structure (W320). Its eastern continuation, in Sq H2, abutted a wall from the late Byzantine phase and did not extend further east. Nevertheless, the floor of the building, discerned in several places as a fine-quality plaster surface with a bedding made of fist-sized fieldstones and river pebbles, was situated above the thick Umayyad wall and sealed it (the floor was removed and does not appear on the plan). It can therefore be assumed that this floor continued eastward, up to the eastern wall that enclosed the complex (Fig. 1). Later Activity (Fig. 8: olive-green) was evident in two main places. In Sq H3, a channel connected to a settling pool (L101) severed the floor of the later mosque, as well as the stylobate wall of the Abbasid period and a wall in the early Byzantine-period mansion. Neither the date nor the function of these elements could be determined with certainty, but they may have served in agricultural or industrial activities that took place during the Middle Ages, once the city itself moved northward to its present-day location. In addition, a large pit (not on plan) uncovered east of the wide Umayyad wall, between Sq H2 and Area F, is indicative of extensive plundering; early twentieth century CE finds found in the pit reflect its date. The pit may have been dug to rob the building stones of the wall, but the extensive destruction left by those who dug it does not allow us to comprehend their actions in the area. In conclusion, the excavation was meant to clarify several issues prior to the final publication of Hirschfeld’s excavations at the site. The finds range in date from the beginning of settlement at the site in the Early Roman period up to the modern era. The Early Roman period is represented primarily by ceramic material and a plaster floor whose architectural context is unclear. Wall 300, which Hirschfeld identified as the temenos wall of the Hadrianeum—the temple of Hadrian in Tiberias—can be now dated with certainty to the second century CE. Regardless of accuracy of this identification, the wall is evidence of monumental construction activity in the center of the ancient city during the first half of the second century CE. Excavations in ​​the bathhouse and near it, undertaken with the hope of exposing material that will help in dating its initial construction, before it was enlarged to the east, did not provide any new data. Thus, the date of the structure—the third–fifth centuries CE—was determined based on relative stratigraphy. Hirschfeld’s excavations focused in large part on a spacious building, which he identified as the Sanhedrin of the sages of Tiberias. A study conducted following Hirschfeld’s death identified the building as an urban mansion—the dwelling of one of the city’s notables—constructed at the beginning of the fifth century CE. The results of this excavation season allowed us to finally determine the date of the building and its general plan, and to identify several phases of renovation that took place during the sixth–seventh centuries CE. This period also provides the first evidence for the renewed use of W300 for later construction, the nature of which has not yet been determined. It is now evident that most of the construction activity that took place in Tiberias following the earthquake of 749 CE annulled the previous architecture. This later construction in the areas excavated during this season—namely a large colonnaded building, apparently a mosque, erected north of the bathhouse—can be dated to the ninth century CE. Adjoining this building to the north was a large courtyard with at least one portico delineating it on the east. A street was paved on a lower terrace, east of this building; the street was lined on the east by a row of shops, which continued to be used, through several phases of renovation, until the city was abandoned at the end of the eleventh century CE. To the southeast of the shops was a public latrine that served the numerous people who visited the shops and the mosque. The drainage system of the structure led to a wide drainage channel that served the city at least as early as the Byzantine period. It too went out of service in the late eleventh century CE. Although the city was largely abandoned at this time, there is some evidence of later (undated) use of the area, mainly in activities related to irrigation and possibly industry, as well as of other activities in the early twentieth century CE. Cytryn-Silverman K. 2009. The Umayyad Mosque of Tiberias. Muqarnas 26:37–61. Cytryn-Silverman K. 2012. Excavations at Tiberias (Spring and Autumn 2009): Remains of a District Capital. In R. Matthews and J. Curtis eds. Proceedings of the 7th International Congress on the Archaeology of the Ancient Near East, 12 April–16 April 2010, the British Museum and UCL, London. Vol. 2. Wiesbaden. Pp. 599–617. Druks A. 1964a. Tiberias. HA 10:14–16 (Hebrew). Druks A. 1964b. Tiberias. HA 12:16 (Hebrew). Hirschfeld Y. and Meir E. 2006. Tiberias – 2004. HA-ESI 118. Hirschfeld Y. and Galor K. 2007. New Excavations in Roman, Byzantine, and Early Islamic Tiberias. In J. Zangenberg, H.W. Attridge and D.B. Martin eds. Religion, Ethnicity and Identity in Ancient Galilee: A Region in Transition. Tübingen. Pp. 207–229. Miller S. 2015. The Late Antique Mosaics of Tiberias: Artistic Trends and Architectural Contexts. Eretz-Israel 31:247-255 (Hebrew, English abstract). Miller S. 2016. The Urban Plan of Tiberias from its Foundation until the Islamic Conquest in Light of New Discoveries In. J. Patrich, O. Peleg-Barkat and E. Ben-Yosef eds. Arise, Walk Through the Land—Studies in the Archaeology and History of the Land of Israel in Memory of Yizhar Hirschfeld on the Tenth Anniversary of His Demise. Jerusalem. Pp. 221–232 (Hebrew). Miller S. 2017. Markers of Pagan Cults in a Jewish City: Rethinking the Hadrianeum of Tiberias. In O. Tal and Z. Weiss eds. Expressions of Cult in the Southern Levant in the Greco-Roman Period: Manifestations in Text and Material Culture. Turnhout. Pp. 95–107. Rabani B. 1953. Notes and News. IEJ 3:265. Rabani B. 1955. Anciens bains a Tiberiade. RB 62:88. Rabani B. 1956. Anciens bains de Tiberiade. RB 63:97–98. Weiss Z. 2016. Houses of the Wealthy in Roman and Late Antique Tiberias. In J. Patrich, O. Peleg-Barkat and E. Ben-Yosef eds. Arise, Walk Through the Land—Studies in the Archaeology and History of the Land of Israel in Memory of Yizhar Hirschfeld on the Tenth Anniversary of His Demise. Jerusalem. Pp. 211–220 (Hebrew). 5. Area F1, the probe beneath the pavement, looking west. 8. Squares H2, H3, plan. 9. Square H3, the wall painting and the mosaic floor from the urban mansion, looking north.